Summer class enrollments have taken a new twist: you don’t even have to be here to take the class! A nationwide reciprocity through the State Authorization Reciprocity Agreement (SARA) has been expanded to include all states except California and Massachusetts, so unless you live in or will be staying in one of those states, you can take many summer classes online, allowing you to spend your summer at the beach or home or wherever you had planned to be, and still earn credit toward graduation. Register for summer 2018 classes by April 13. Three summer academies and a new dual enrollment program will make it possible for high school students to gain insight into career paths or to earn college course credit. The academies, the Huntingdon Leadership Academy, the Huntingdon Health Sciences Academy, and the Economic and Community Development Scholars Program, allow rising high school juniors and/or seniors to explore vocational callings in ministry, health and medicine, or community and economic development, respectively. Through dual enrollment, College Algebra and World Civilizations will be offered for rising high school juniors and seniors only June 4–28, 9:00 to 11:00 a.m., and 1:00 to 3:00 p.m., respectively. The cost is $150 per credit hour, $450 per class. Credit is recorded as dual enrollment credit and is transferable to any regionally accredited college or university. The Huntingdon faculty has adopted a slightly amended core curriculum and has voted to discontinue entrance into two programs of study beginning fall 2018. For students entering in the fall of 2018, new requirements in the core curriculum will affect the religion portion of the core only. New course numbers are pending and will be announced when available. The Christian Ministries major has been discontinued in favor of the more broadly applicable Religion major. Secondary teacher education in Chemistry has been discontinued in favor of the more broadly applicable secondary teacher education path in Chemistry-General Science. In addition, a few course changes have been made: SSPE 308, Kinesiology, may now be taken as a general elective by students in other majors; SOC 103, Sociology, will be reintroduced to the course offerings; and a new course, Mathematics for Elementary Education, targets skills necessary for the Praxis exam. Beginning Monday, March 19, students may register for Fall Term 2018 classes. In preparation, you should meet with your academic adviser(s) this week and choose your courses. Registration is completed online through Self Service during designated dates for your level of study, beginning with seniors on Monday. Be aware that your account must be in good standing and you must have met the prerequisites for the courses you choose in order for your registration to be recorded. For more information, look for an email you received 3/7/18 from Adrienne Gaines, registrar. See the Fall 2018 Schedule of Classes. Ability Sport Network director Dr. Lisa Olenik Dorman, assistant director Dr. Jared Rehm, student intern Anna Blair Cockrell, and learning assistant specialist Mark White ’17 worked with partners from the University of Alabama-Huntsville (UAH) to train 34 special educators, physical educators, and elementary educators from the Mobile region in techniques needed to teach children with disabilities adapted sport (i.e., wheelchair basketball, sit volleyball, and boccia). The February event included a presentation by Dr. Dorman about techniques used when including students who have autism in a physical education program. Although our current ASN program does not serve that disability group, the Alabama State Department of Education asked Dr. Dorman to provide this training as the teachers/physical educators in the schools in that region wanted more information on the inclusion of children with autism in their traditional programs. Huntingdon’s ongoing partnership to provide Adapted Physical Education skills training for special needs children at Wilson and Garrett Elementary Schools in Montgomery has led to a third partner, Pike Road Schools, joining the A.P.E. outreach this spring. Each school will bring special needs students to campus five times this semester. The program not only benefits the elementary students, but also the Huntingdon students who develop teaching and coaching skills for working with special populations. A new Miss Huntingdon will be crowned this Saturday at the conclusion of the annual pageant, to be held at 7:00 p.m. March 17 in Drum Theater. This year there are 15 contestants—more than any year in recent memory. They are: Autumn Allday ’20, Valley Grande, Ala.; Christina Arnette ’20, Wetumpka, Ala.; Isabelle Barrera ’20, Montgomery; Colleen Collins ’20 Crestview, Fla.; Jocelynn Griffin ’21, Pensacola Beach, Fla.; Noah Harrison ’20, Montgomery; Lindsey Hicks ’19, Tallassee, Ala.; Sidney Ison ’20, Huntsville, Ala.; Candy Martinez ’20, Jemison, Ala.; Cassidy Oswald ’20, Troy, Ala.; Amber Shirley ’20, Brundidge, Ala.; Linsey Smithart ’21, Andalusia, Ala.; Megan Ventry ’21, Acworth, Ga.; Kasi Wilson ’20, Munford, Ala.; and Taylor Young ’19, Montgomery. The winner will be crowned by the current Miss Huntingdon, Josie Waddell ’19. Huntingdon will host the Hap Arnold Lecture Series, “Leading and Serving in Changing Times,” Wednesday, April 4, at 5:30 p.m. in Ligon Chapel, Flowers Hall. The lecture, conducted by a few members of the Air War College at Maxwell Air Force Base, is free and open to the public. This is the second time Huntingdon has partnered with the Air War College to offer this event. The format is for each speaker to speak on an aspect of his or her leadership and service roles, and then to take questions from the audience. Congratulations to all the students who stepped up to run for leadership roles in the Student Government Association this year. Elections were held last week. The new SGA president is Savannah Gibbs, of Samson, Alabama. Also elected: Virginia Gaston, vice president; Jordan Fleming, secretary; and Sidney Carol Hall, treasurer. For class officers, Anna Blair Cockrell was elected president of the Class of 2019. Class of 2020 officers: Candy Martinez, president; Colleen Collins, vice president; Mark Melchor, treasurer; Class of 2021 officers: Shelby McAllister, president; George “Mac” McNeilly, vice president; Christina Arnette, secretary. Student also elected senators to serve on behalf of academic departments; they are: Biology: Sidney Ison, Mary Stanley, and Kayley Yates; Business: Conner Howard and Zoya Robinson; Chemistry: Victoria Parks and Amber Shirley; Math: Randie Caine; Psychology: Trevor Berry; Religion: Chase McKoon; Sport Science: Sarah Best, William Crosby, and Peyton Dean. Representing residents, the senators are Autumn Allday and Alexis DeVuyst. The Montgomery County Commission is seeking candidates for the 2018 Montgomery County Student Apprenticeship Program. Students ages 16–22 may participate in the 8-week program, June 4–July 27, 2018. Applications and more information can be found on the MCC website: www.mc-ala.org. Applications and a letter of recommendation (from a Montgomery County Commissioner) must be submitted by April 20. Internships are also available. Contact the personnel office at (334) 625-2675 to learn more. SENIORS: DEADLINE to order your cap, gown, and graduation items: 11:59 p.m., Friday, March 16; order online at http://colleges.herffjones.com/college/_hc/. Friday, March 16, is the last day to withdraw from a course and receive a WP or WF grade. See an email received from Maryann Beck 3/12/18 for more information. Friday, March 16, is also Temple Beth Or Night. See a Religion professor for more information. Voice of Justice will sponsor a kickball tournament Saturday, March 17, 10:00 a.m. to 1:00 p.m. on The Green. $2 per participant, 10 people per team. The Women’s Center will offer the Academy-Award-nominated film, Lady Bird, for a free showing in honor of Women’s History Month, Thursday, March 15, at 7:00 p.m. in the Library Atrium. There is no charge to attend. The Prelude wants your work! The spring issue of the literary magazine is accepting artwork, poems, short stories, photos, and other creative works. Send written work by March 19, art and photos by April 4, to prelude@hawks.huntingdon.edu. Applications to serve on the College’s Judicial Board are due Monday, April 2. See Craig Shore in the Hut for more information or email cshore@hawks.huntingdon.edu. Register for Summer 2018 before April 13, 2018. SaveFirst tax preparation continues in Cloverdale 123 through April 17. To make an appointment, call 1-888-998-2925. Traditional Day Program: 9:00 a.m.
Evening Bachelor’s Degree Program: 6:00 p.m.
April 27—Spend a day shadowing osteopathic medical students during ShaDO Day at the Alabama College of Osteopathic Medicine, 1:00–6:00 p.m. There is a $10 fee. Register by emailing somadeco@acom.edu. The National Panhellenic Conference has recognized Huntingdon College with an Academic Recognition Award, given to campuses that have an All-Panhellenic GPA higher than their All-Women’s GPA. Huntingdon SSPE students and faculty, the Ability Sport Network, and Coach Latonia Brady and the Department of Athletics hosted the Special Olympics State Basketball Tournament, Friday, March 9. An op-ed piece by Dr. Blake Ball, assistant professor of history, “Wakonda and the Dream of a Black Homeland,” appeared in the Washington Post earlier this month. Kendrick Ballard ’18 was named USA South Player of the Week for men’s lacrosse February 26 for his performance in the team’s wins over Oglethorpe and Brevard. He scored 7 goals, including a game-winning overtime goal, and had one assist. Luke Boyd ’18, a brother of Lambda Chi Alpha, was recognized as Greek Man of the Year during Greek Awards night, March 9. Laura Marie Tyree Brelsford ’05, who serves as director of community relations, was recognized as Greek Adviser of the Year during Awards Night last week. She advises to Alpha Omicron Pi women’s fraternity. Dr. Coleman Cosgrove ’06 has completed medical school and awaits his psychiatry residency match, which will be announced Friday, March 16. Dexter Dean ’13 has completed his doctorate in chemistry at the University of Southern Mississippi. He, with wife Sara Beth Terry Dean, will move to Silver Spring, Maryland, in June, where he will begin a post-doctoral fellowship with the National Institutes of Health. Sam Garrison ’18 has been offered the opportunity to train in the Edward Jones Financial Advisor Career Development program. Dr. Jennings (Jeb) Haynes ’02 has opened an independent outpatient clinical psychology practice, Southeast Psychology, in Auburn. Bradley Harris ’21 was named USA South Rookie of the Week for baseball March 5, after batting .533 with three runs and an RBI in four games during the week prior. Austin Hill ’14 has signed his fourth professional basketball contract since graduating from Huntingdon. He will play in Australia for a club based in Darwin, April–September 2018. Sam Hitt ’19 was named USA South Defensive Player of the Week for men’s lacrosse March 5. It was the second time he earned that recognition. Jamie Langford ’17 and Dr. Mike Bamman, associate professor of exercise science, made a poster presentation on the topic, “Concussion Education Awareness Among College Athletes and Coaches,” for the 2018 Southeast American College of Sports Medicine Annual Meeting, February 16. Taft Ledbetter ’17 has been hired as a realtor with Three Sixty Real Estate in East Alabama (Auburn). Farrah Mahan ’16 has announced her engagement to Will Jackson. Morgan McQueen ’11 has announced her engagement to Justin Zeigler. 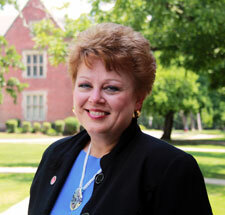 Dr. Maureen Kendrick Murphy ’78, professor of chemistry, was recognized as Faculty Member of the Year by Greek life. Mike (’10) and Abby Grace Chandler Payson ’11 welcomed their second child, son Elijah Shields Payson, March 1, 2018. Dr. Tom Perrin, assistant provost, has gained American citizenship. He is originally from Great Britain. Shaw Pritchett ’92, an accountant with Jackson Thornton, led Business and Accounting Club students in a lively discussion about cryptocurrency and provided a 2018 stock market update earlier this month. Shaw shared with students his non-traditional CPA/Financial Adviser career track. His content was timely and students gave the presentation rave reviews. Dylan Pugh ’11 and Chasity Ward Pugh ’13 live in Auburn, where he is a detective and she is a chemist/toxicologist. Sarah Manikas Rech ’93 and her husband, Joe, will move from Montgomery to Clearwater, Fla., in May, where Joe will work with Special Forces at MacDill AFB and Sarah has accepted a position as the K-8 School Counselor for LCC Day School in St. Petersburg. Kasey Savage ’18 was recognized as Greek Woman of the Year during Greek Awards Night last week. She is a member of Phi Mu. Josie Waddell ’19 was named USA South Player of the Week for women’s tennis March 5. Cathy Wolfe, assistant vice president for development operations, was recognized as Staff Member of the Year by Greek life. Cheyenne Young ’14 and Constantine “Dino” Tampary ’12 will be married May 19 in the Malbis Greek Orthodox Church. Cheyenne will graduate from Jones School of Law in May. Dino began work as an accountant with McDaniel and Associates in Dothan recently. Former Huntingdon Dean of Admission Bruce Triftshauser died March 3, 2018, following a battle with brain cancer. After serving in higher education, he began a career with Wilson Learning and later owned Business Performance Solutions, a Wilson licensee. We extend our sympathies to his family, including his wife, Julia Inman Triftshauser ’83, and daughter, Carna Triftshauser ’97. Funeral services will be held Saturday, March 17, at 11:00 a.m. at Alabama Heritage Funeral Home, with a Celebration of Life following at Woodland Creek Community Center in Pike Road. Prayers are requested for former SGA president Zachary A. Turner ’14, assistant director of leadership and student involvement at the University of Southern Mississippi. Zack has undergone four surgeries for a cyst on his brain and has been placed on life support intermittently. We pray that recovery can begin soon, and that he gains strength for the journey ahead. NEXT TALON: Week of April 2. News deadline: Monday, April 2. Send your news to news@hawks.huntingdon.edu. Have a great spring break! The Talon is produced by the Office of Communications and is e-mailed to students, faculty, and staff, and to those parents, friends, neighbors, alumni, and others who have requested to receive it. If you would like to change your e-mail address or be added to or removed from the list, simply send your request to Su Ofe at news@hawks.huntingdon.edu (be sure to include your relationship to the College so that you can be added to or removed from the correct list). The Talon is posted on the College Web site, www.huntingdon.edu. Huntingdon College is committed to a policy against legally impermissible, arbitrary, or unreasonable discriminatory practices. For more information, visit www.huntingdon.edu/misconduct.